Just announced with the ROCK 95 Morning Crew! The World’s greatest Rock ‘n Roll Band is coming to the area this summer! It’ll be a Canada Day weekend to remember for years to come! 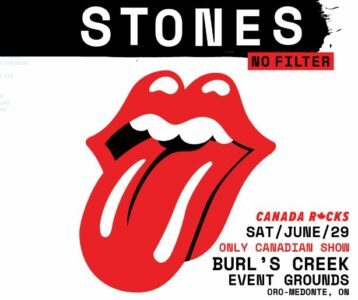 This morning, a little after 8:00 the ROCK 95 Morning Crew announced the Rolling Stones are coming to Burl’s Creek Event Grounds in Oro-Medonte for the ONLY Canadian date on their No Filter Tour this summer. The Canada Rocks with the Rolling Stones show will be staged at Burl’s Creek Event Grounds on the Saturday night of the Canada Day Holiday Weekend. Tickets go on sale this Friday morning at 10am through Ticketmaster and be listening throughout the day today and all this week for a chance to BEAT the Box Office and WIN tickets before they even go on sale! The NO FILTER Tour will make stops in Los Angeles, Washington, D.C., Philadelphia, New York, and Chicago before heading north to Burl’s Creek for Canada Day weekend!